Please accept my blessings. I am in due receipt of your letter dated 22nd May, 1971 and have noted the contents carefully. I am so glad to hear how things are going so nicely there in preparation for Rathayatra festival and I have read the enclosed brochure for the festival written by you. It is very nice. So far as my going there by the 27th June, that may not be possible. Most probably I will have to attend London festival this year because three times I have attended Rathayatra festival in San Francisco and this time I have been very fervently requested to attend the London Rathayatra festival, where they are expecting 50,000 participants also. So it is not possible to attend both festivals. I will try my best to go to San Francisco also, but there is little chance. Still, I shall go to San Francisco when I return to U.S.A. So you should go on with the festival more enthusiastically, even in my absence. Presently I am in Bombay and from here I am going to Moscow on the 20th June, for five days. From there I shall visit Paris and then London. After the festival I will be going to N.Y. and then on to Los Angeles and San Francisco. Please offer my blessings to all the sincere boys and girls who are working so hard to make Lord Jagannatha's festival a grand success. Hoping this will meet you in good health. Please accept my blessings. I am in due receipt of your letter dated 25th May, 1971 and have noted the contents carefully. So far the small paperback edition of KRSNA book is concerned, we will not be getting it for six months at least. So go on distributing hardbound and, although I have ordered them (perhaps by now you have received the statement from Dai Nippon) if you think it is best, I can put it off for some time. Besides that, in India we are distributing only a few hundred KRSNA books out of 15,000 because they are being distributed only via life membership program. So we are getting the money but we are distributing only to life members. So under the circumstances if you think they should be returned to U.S.A. then you can let me know, because here they are being distributed very slowly. For printing of course the priority is Bhagavad-gita. But the $20,000. given by the book fund for BTG should be replaced first of all. That is priority. You can go on depositing in the checking a/c no. 308161625, Bank of America, Pico-La Cienega Branch. All BTG collections and any book fund collections should be deposited so that you are able to repay at the rate of $5,000 per month. Any book distribution collections over and above that may be used for printing of the books, and as you see fit. So far I know, the press is not competent to take outside work, as I know it by their past dealings. 10% per printing costs for maintenance needs, that was the arrangement, but if the maintenance costs have to be taken up by the book fund, that will be a white elephant problem. So far I have got two tickets to return to L.A. and if more men are to return with me, I shall let you know. Just now I have received one telegram from Brahmananda. He is in Karachi and I have advised him to come here immediately. So all the important men have come here already to India. So for Dayananda and family coming here, that is all right, but the incense department may not suffer in his absence. Actually we have need of many men in India, at least another 50 or 60. But they need not be important men. Assistant men will do nicely. So if you can arrange to send 50 or 60 men here for propaganda work in Calcutta and Bombay, that will be very nice. We require at least 100 of our American boys to make propaganda all over India. So Dayananda may come as the leader of another 50 or 60 men. The proposition in San Francisco sounds all right, if Jayananda is willing to take the responsibility to make payments on the remaining $80,000 due. Please accept my blessings. I am in due receipt of your letters dated 30th May and 1st June and have noted the contents carefully. I have received all the photographs of the paintings for the enlarged edition of Bhagavad-gita As It Is, and they are so very beautiful. Everyone here is so much appreciative of all you artists. All of you have my full blessings and your godbrothers' congratulations. Krishna will surely bless you all. Thank you very much. The two men sitting up on Lord Jagannatha's altar are pujaris. They are just sitting there and anyone coming to make offering to the Deity, they are accepting and returning tulasi and caranamrta. So they are very busy. And when there is bhoga offering, no visitors are allowed in the temple. The floor is immediately washed and pots and trays of foodstuffs are placed in the room. And each time Jagannatha is offered prasadam, there is enough for one thousand men. Similarly he is offered 56 times in a day. And they don't purchase any ingredients from the market. They have got their own agricultural field and big management. Another temple in South India is called Tirupati where daily they collect Rs 100,000/-. The floor of Jagannatha temple is made of stone and the room is dark behind Lord Jagannatha. Generally in India the Deity room is very dark; no electricity and only two lamps. You can show in sequence in a painting how Narada Muni is leaving the material body and accepting a spiritual body and entering into Lord Visnu and again coming out through Brahma's heart. Arjuna was not present when Krishna spoke Bhagavad-gita to the sun god. He was present on a different occasion. So the picture is all right. The painting of the chariot of the body is nice. Yes, it will be easier for me to answer your questions if I can see a sketch of the painting. So far as the sacrificial fire at Naimisaranya, it was a big pit, say four feet square surrounded by raised walls 8 inches high and within the pit was the fire. That is the system. Our sacrificial fire arenas are temporary only. Yes, it was near Suta Goswami's vyasasana. Regarding Satsvarupa's engagement, his main business is editorial and to improve the condition of the Boston temple also. There is a vast amount of editing work. It is not an easy job. We have to print so many books and if he becomes an expert editor it will be a great asset to our mission, and he has got the capacity. Very soon I am returning and I shall overburden him with dictaphone tapes. He will have more than enough engagement. With reference to the above, I beg to advise you that from the month of July, 1971, Srimati Radharani De may be paid Rs 500/- per month and you can debit my above account. Please acknowledge receipt of this letter at the above given address. Please accept my blessings. I beg to thank you very much for your letter dated 4th April, 1971. Please excuse this late reply. Due to my touring program, I have only just recently received your letter. Yes, very soon I am going to New York. Presently I am in Bombay. From here I shall be going to London and possibly to Moscow also. After that I shall be going on to N.Y. without a doubt. I am very glad to learn that you are organizing your press work more cooperatively. That gives me so much pleasure. When I go there I shall give you so much work that it will be an over-burden, so that you will be so much engaged. All my senior disciples are requesting me to revive my translating work and I would like to do so for the remaining days of my life. So you have to help me to get Srimad-Bhagavatam and the other translating work done as quickly as possible. I have not received your handkerchief as of yet. Please offer my blessings to the others. Hoping this will meet you in good health. Please accept my blessings. I thank you very much for your letter post dated 13rd May, 1971 and have noted the contents. So far as your getting yourself married, I have no objection and if after referring the matter to Karandhara Prabhu, he agrees, then all my blessings are there. And you may inform Yamuna that I am glad to accept her as my disciple and just as soon as I go there, she can be initiated. Presently I am in Bombay and very soon I shall be going to London and perhaps to Moscow. 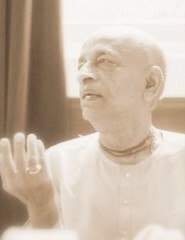 From there I shall be going to N.Y. and on to Los Angeles, perhaps for Rathayatra on June 27th, 1971. At that time, if she is qualified, then she may take over pujari duties there in Laguna Beach. That will be very nice. And you can help her in Deity worship also. P.S. I have just received your letters dated 20th and 24th May, 1971 respectively along with a check for $10.00. I am so glad to accept both Yamuna and Sanaka as my duly initiated disciples. Their beads and letters follow. You have my full blessings for marriage to Yamuna. Please accept my blessings. I am in due receipt of your letter dated 12th May, 1971 and have noted the contents. So far as your relocating your temple from Tucson to Phoenix, that is a GBC matter and so it should be discussed with the GBC members and especially with Karandhara Prabhu. I cannot suggest anything very well from such a distant place. Presently I am in Bombay and from here I shall be going to London and perhaps to Moscow for a few days also. Then I shall be going to N.Y. and on to Los Angeles. At that time Michael and Patrick may come to be initiated. Yes, you always have my blessings. Just go on and work sincerely to push on this movement and you will have the blessings of Caitanya Mahaprabhu as well. Hoping this will meet you in good health. Please accept my blessings. I beg to acknowledge receipt of your letter dated 17th May, 1971 and have noted the contents. I am glad to note how you are working for securing ads for the special Rathayatra magazine. We have made such ads for our programs here in India and it has been very successful. Of course in India when they are paying for an ad, they are actually giving a donation, but it is registered as an ad. But in U.S.A. unless they are seeing the circulation and how much they will be benefited, they won't spend. They are simply after the advertisement. But go on with your program enthusiastically and Krishna will help you. Presently I am in Bombay and from here I will be going to London and perhaps to Moscow for a short time. From there I will be going to N.Y. and then on to Los Angeles. I am very much wanting to attend the Rathayatra festival in San Francisco and if time permits and Krishna so desires, then I shall reach there by the time of the festival. And when I go there, I shall be very glad to appear on such television conference as described in your letter. So go ahead and try for it. And if you can approach such big companies for support, that will be very good also. Try your best and Krishna will help you. So far as getting yourself married, I have no objection. If it is all right with Kesava Prabhu, then you have my blessings. And Jaga Dasi can become initiated also when I come there.